1. Vases with no handles are numbered in the 800 sequence; jugs in the 300 sequence; and two-handled vases most likely to be in the 60 sequence. The original 313 form had lines that were perhaps a little too close to Murano glass in ways that molded pottery couldn’t handle. common to have only numbers or number and country. 3. Ruscha mostly used white/buff clay but did use red clay from time to time, apparently most often in the late 50s to early 60s. The same shape in red clay tends to be slightly smaller with finer detailing than a version with white clay. 6. My understanding is that Scheurich now owns the Ruscha name. Since Scheurich has taken advantage of interest in vintage items by re-issuing some of their own successes, they may try to use the Ruscha name in the same way. Always buy pottery based on quality, not “name”. 7. The iconic Ruscha 313 form was revised at some point, although when remains unclear. Shape changes made the 313 easier to produce in larger numbers, which is likely a main reason why the revised version is more common. Some of the later glazes, however, are still spectacular. For more information and items for sale, please visit our home page. Photos used show an original form 313, a later version of shape 333 (Ruscha did re-use some numbers. 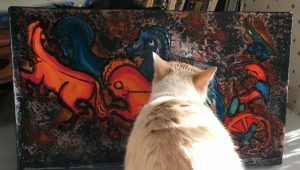 ), and a Quadriga plaque….Bianca not included. 1. They were better at glazes than shapes. While Scheurich designers produced a few excellent forms, many of the shapes ranged from poor to only fair. Some, such as the classic 517, were very good in terms of proportions but not inventive. 2. The number of glazes produced from the mid 1950s through the mid 1980s is almost beyond imagining or counting. With such numbers, there were many mediocre results, but Scheurich also produced some of the most impressive glazes of the era. 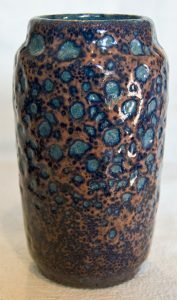 “Market” value is almost entirely based on glaze with the exception of a few shapes with better design. 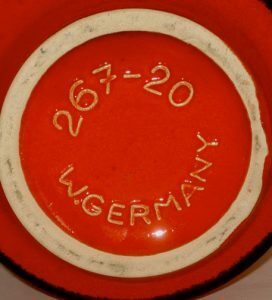 A shape such as 271 designed by Heinz Siery is very commonly available, and common or lesser decorations should usually be in the $15 range. The best and rarest so far known can justify a price in the $150 range. 3. Scheurich re-used form numbers more than other companies. Searching or identifying Scheurich based on the shape number and size is problematic at best because many numbers were used 2-4 times. Shapes are sometimes similar, sometimes barely related. 4. Scheurich number placement varies, sometimes around the edge, sometimes centered. Form numbers are 3 digits, and the following number is the approximate size in centimeters. Until the late 1970s or 80s, Scheurich never included the company name. A little later they started using an embossed “three-circle” mark. 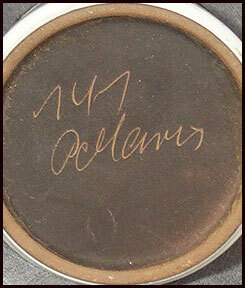 Most items with this mark are lesser quality and unlikely to become collectible. 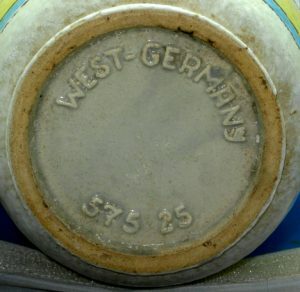 If you see an item with only “Germany” and the three-circle mark, it’s almost certainly post-reunification. 5. Scheurich used white/buff clay. 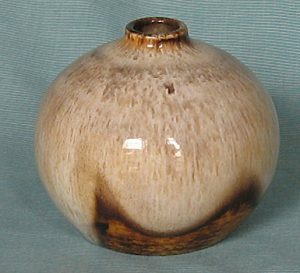 I am not aware of a single piece of Scheurich in any other clay, but the glaze does sometimes stain the clay slightly. 6. Some of the embossed designs and a few other forms have their own name. These include Vienna/Wien, Ceramos, Jura, and Coral/Koralle. Be aware that some items have “collector” names that were given before the company names were known. A prime example is Amsterdam, which was dubbed Onion since the design looks like a cut onion. However, the name Amsterdam reveals that the design is actually based on the image of a tulip bulb. 7. Scheurich floor vases with animals are among the most popular with collectors, but the quality varies, especially when the primary glaze overruns the decoration. 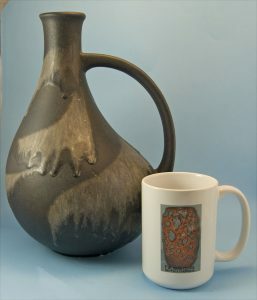 Value should take both the glaze and the quality of the individual piece into consideration. This is always true but applies particularly strongly with these items. 8. Scheurich was by far the largest producer, so most items are common. The company is still in business and has released the 271 shape (now marked with a clear plastic label) and has re-issued Amsterdam, but the design does not continue to the rim as it did on the originals. 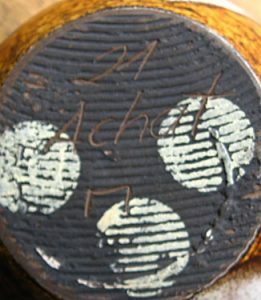 Pictures show a fairly common Scheurich floor vase shape with an uncommon glaze, one of Scheurich’s “all over” volcanic glazes, and example of “fat lava”, and a fairly typical Scheurich base, keeping in mind that the bases were almost as numerous as the glazes….or so it seems when trying to sort them out. For more information plus items for sale, visit our home page…..not just the usual suspects. Bay items from the 1950s and early 60s were very popular before W. German pottery itself became popular. Some of the Bodo Mans designs fit into the decorative styles collectors wanted in the late 1980s and into the mid 1990s. The Bodo Mans items were actually more valuable then in that collector group than they are now as W.
Bay shape 575 with a circa 1960 decor, no current attribution to designer. German collectibles, which is also partly why the Bodo Mans name still resonates with collectors. 1. The 1950s and early 60s items remain the most popular, along with some of the embossed designs. Quality of decoration with the “painted” glazes varies widely, so select carefully and don’t overpay for a sloppy example. 2. Bay kept up when designs began changing in the early 60s, but their overall design quality began falling after that. A large percentage of Bay items are in the lower “tourist” and “kitsch” categories. to have changed emphasis, but there are some late examples that stand as some of the best work Bay produced. 4. Bay only used white/buff clay. I am not aware of a single example in a red/brown clay. Lettering/numbering style varied widely, so not all Bay items have the lower case “y”, but it remains true that if you see the lower case “y” on an item with white clay, Bay is the first company to check…..keeping in mind that Fohr and a few other companies used that combination at times. 5. Don’t assume that every Bodo Mans design will be valuable, and don’t believe every attribution to Mans. He only worked at Bay for a fairly short time. For more information plus items for sale, check our home page…..not just the usual suspects. This is part of a series giving a few of the key things to know about individual companies. 1. 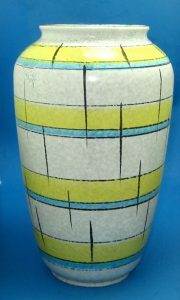 Ceramano started in 1959 and was created by Jacob Schwadderlap (also owner of Jasba) to focus more specifically on higher quality art pottery. 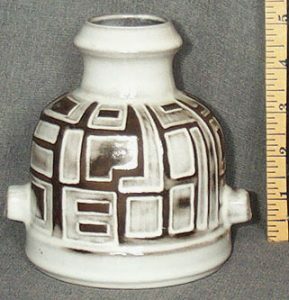 (While many commercial potteries have produced art pottery lines, most of them also produced other lines that were less expensive to produce and sell in larger quantities. 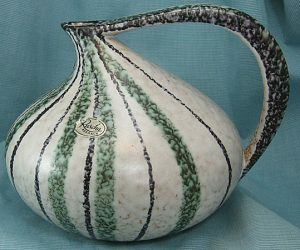 In many cases, art pottery lines were only possible because the more decorative and utilitarian items made enough profit to experiment with “art”. 2. The original designer was Hanns Welling. Gerda Heuckeroth also did design work. 3. Ceramano used brown to red-brown clay with the exception of some blanks purchased from Ruscha in the very early years (possibly just wallplates). 7. Some of the best known items include Pergamon and Rubin. Overall, Pergamon and a few others are fairly common, but form and quality of decoration can vary widely, which should be taken into account when considering “market value”. Better decorated, harder to find shapes or sizes can still be of significant “worth”. Rubin is harder to find and typically sells high, but there are also a variety of rare, impressive glazes of greater aesthetic value that may sell at a relative bargain….if you find them. 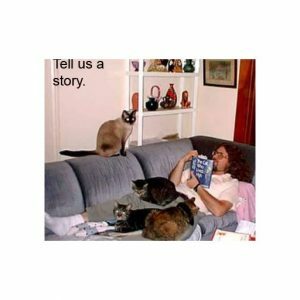 Visit our home page for other essays and videos plus West and East German pottery for sale……and other goodies.